Every superhero knows how to accessorize—including Captain America. Captain America’s iconic shield (which has gone through numerous design changes since its first appearance in the 1940s Marvel Comics) acts as both a defensive and offensive tool, depending on the situation at hand. 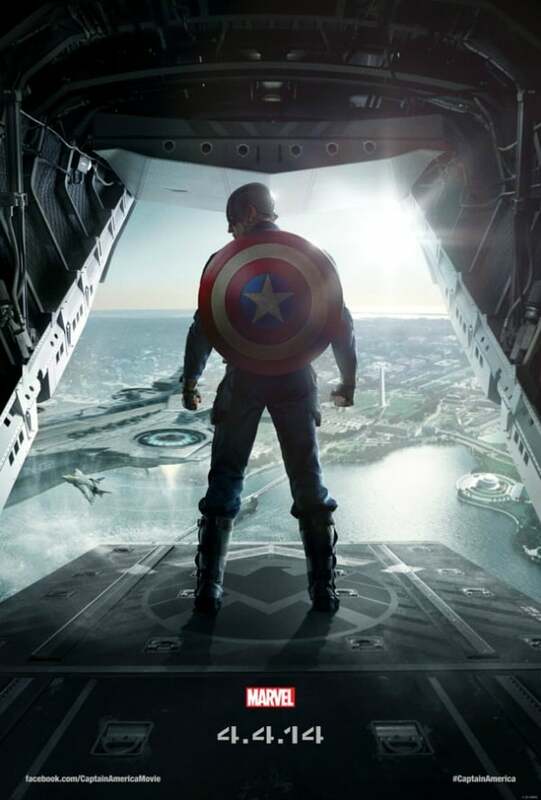 Captain America’s shield will make its next appearance later this year on April 4, 2014 in Marvel’s Captain America: The Winter Soldier. I’ve spent a decent amount of time poring over the artwork of the shield from decades-old comic books, and I have to say that the design of the shield seen in the recent Marvel films is my favorite of all. 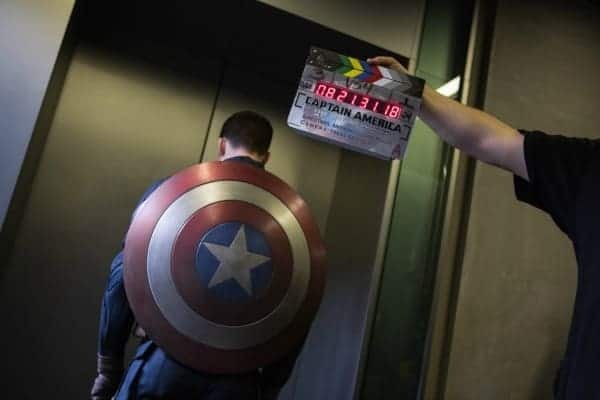 The artistic credit for Marvel’s Captain America shield goes to Russell Bobbitt, who has served as the Property Master on nearly all of the Marvel films since Iron Man in 2008. The Disney/Marvel Bloggers chat with Property Master Russell Bobbitt about the shield. We had the pleasure of speaking to him in April of 2013 about Captain America’s shield…and even got to have our photographs taken with one of them! 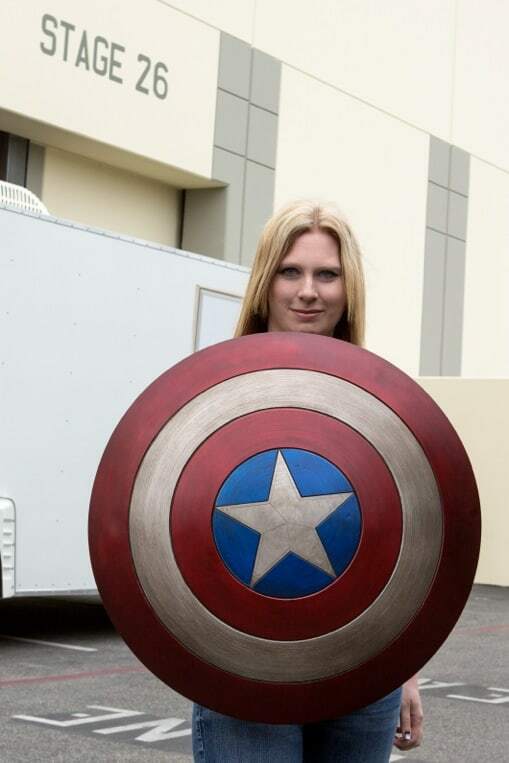 Russell made over FIFTY prop shields for all of the different scenarios that Captain America finds himself in. Materials used for these shields include: hard rubber, soft rubber, fiberglass, and metal. In the picture below, I’m holding one of the shields made of hard rubber. When you see Chris Evans (Captain America) walking with the shield on his back versus fighting with the shield, it’s not the same shield. If the shield is on his back, Bobbitt has him carry one of the heavy ones. This way when he’s photographed from behind, the shield looks like shiny, new metal. When you see him fighting with the shield, he’s holding one of the shields made from a lighter material. As it gets closer to April 4, 2014, I’ll have even more details about Captain America: The Winter Soldier to share with you. In the meantime, catch up on all the latest news about the film on Facebook and Twitter. This was a wonderful event, getting to hold the shield was awesome right? I am counting down the days until this movie comes out! I can not wait for the new movie of Captain America to come out. I like the shield and it looks like a wonderful event to participate in! Oh wow! What a fun trip! You are super lucky to get opportunities like this. This is awesome! What a cool opportunity! Looks like it was a lot of fun!!! I would enjoy that myself. omg my husband would be so jealous of you lol what an awesome experience! cool factoid about the shield! Lucky you! Looked like a really fun event and can’t wait for the movie as I enjoyed the first one! You got to hold the shield, wow!! I really am looking forward to seeing Captain America: The Winter Soldier, thanks for this post. I look forward to reading your future posts about this movie. Well, how stinking cool is THAT?!? Privilege. And I’m not even a big Marvel fan. Thanks for sharing. How exciting, thank you for sharing, great photos! Can’t wait to see this movie! Thank you for sharing. Wow, congratulations! Thanks for sharing! Sounds like it was a great time, my boyfriend would love to be able to hold this shield. He’s a fan of anything “Marvel” and his collection of comics proves it. That must have been so cool! What a great experience for you, I’m very envious. I love the Iron Man movies. So glad you enjoyed it–looks very cool!